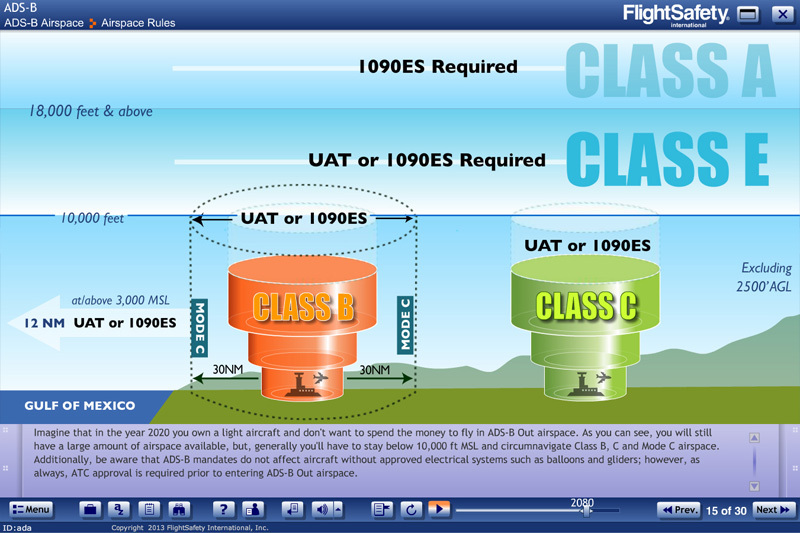 FlightSafety's FAA approved ADS-B course will provide pilots with the training necessary to apply for FAA authorization to conduct ADS-B Out operations outside the boundaries of U.S.-designated airspace. The training is conducted in accordance with FAA Advisory Circular 90-114 and addresses the requirements of Federal Regulations Part 91.225 and 91.227. This course is also compliant with EASA AMC 20-24, EASA AMC 20-40, and Transport Canada AC 700-009. 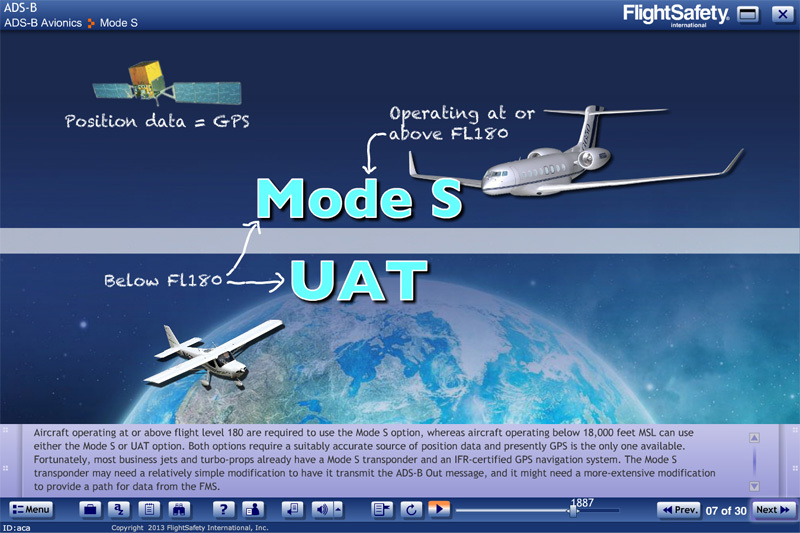 When completed, the pilot will be issued a certificate of training as evidence of being qualified for authorization to use the ADS-B system as required by certain routes and procedures worldwide. The certificate is part of the documentation submitted to the FAA when requesting issuance of this authorization. 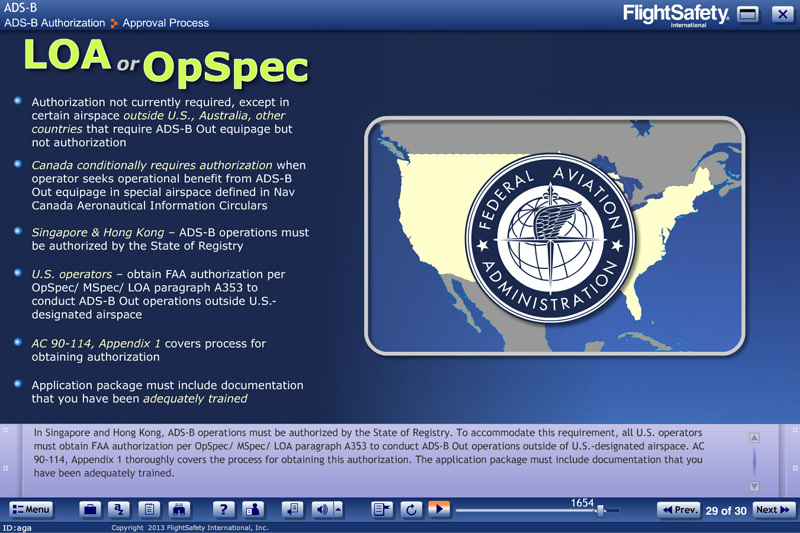 For more information about LOA requirements please see FAA Info 13009 and AC 90-114. 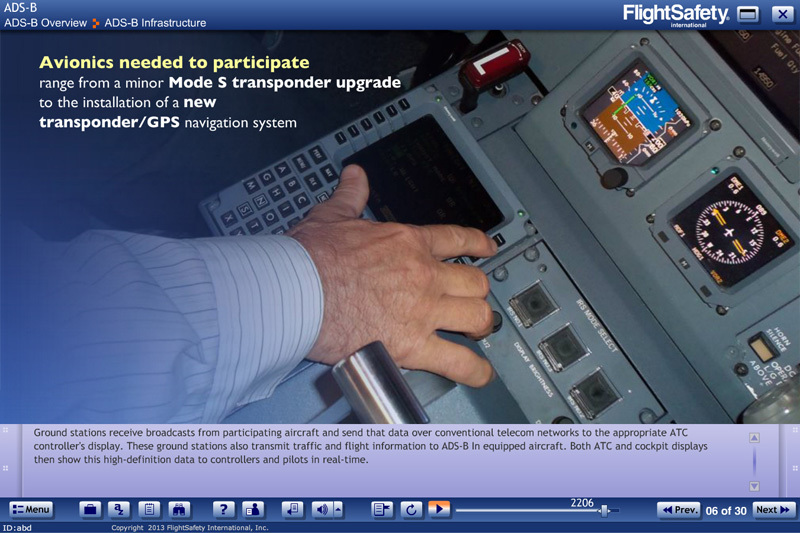 The objective of this course is to develop the pilot's knowledge of ADS-B system operation, and both the normal and abnormal operating procedures. Moreover, pilots will review the flight planning considerations, MEL requirements, and important human factors issues. Finally, pilots will be introduced to two features of ADS-B operations that business jets will not use until later when a better case can be made for their necessity: ADS-B In operations and the In-Trail Procedure. Regulatory Requirements: Training is conducted in accordance with FAA Advisory Circular 90-114 and addresses the requirements of Federal Regulations Part 91.225 and 91.227, when approved by a POI. This course is also compliant with EASA AMC 20-24, EASA AMC 20-40, and Transport Canada AC 700-009.